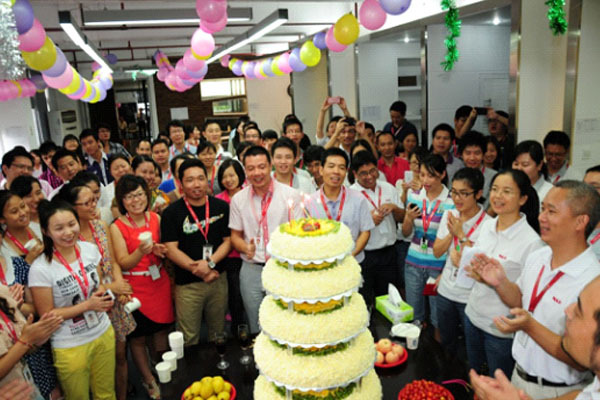 September 1st, 2012 is Shenzhen Mele Digital Technology Ltd. 8th Anniversary day, Mele’s employees gather in this happy occasion and gives their best wishes to Mele’s 8th birthday! 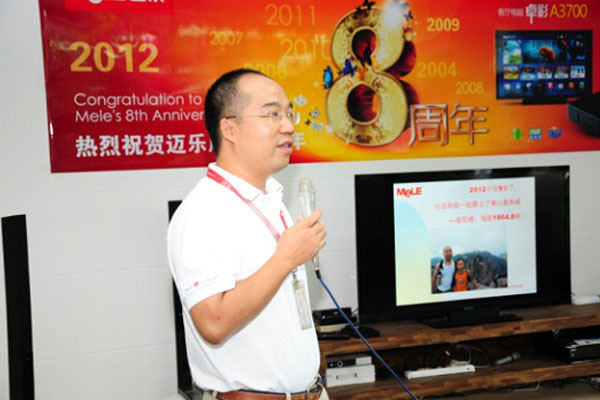 In the celebration party, Mele’s Deputy General Manager Mr. Xia HongZhi share memorabilia of the company over the years and future tends to Mele’s employees. Looking back on 2011, Mele Digital completed multiple research and development of new products and preparations for multiple new projects, and because of the forward-looking market planning of the Living Room PC products, these products have currently become the hot sale products in the market. Also, Mele Pingshan Industrial Park project was officially launched, and has laid a solid foundation for Mele future development planning. 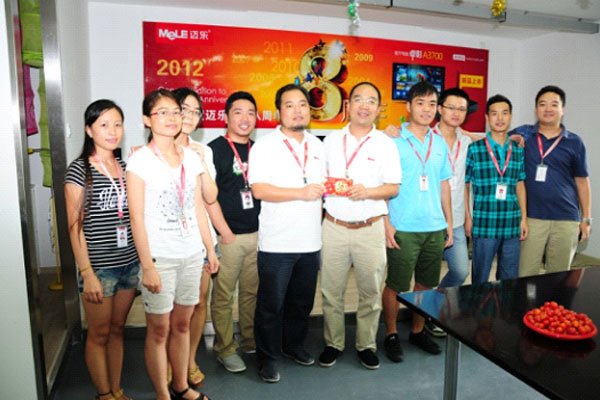 In December 2011, Mele Digital successfully held the 8th Mele Industrial Design contest, embodies Mele does not only has strength on product development and market expansion ability, but also focus on the development of modern industrial design technology! Mele staff gathered lively together. Mele domestic own brand department has been committed to the expansion of the domestic market and the traditional channel distributors throughout the cities across the country. In 2012, Mele Digital continues to focus on domestic market, has signed cooperation agreement with WaSu TV, Voole, CNTV, QiYi HD and many other Internet video licensor and content owner. Mele users can enjoy lots of online HD television variety show using the above applications. In user experience, Mele not only remain old product firmware update, and also put ruthless efforts on new product firmware development progress. The Living Room PC firmware are kept updated monthly which keeps on increasing the product usage experience. Mele also launched the E-GO mobile hard disk box, Air Mouse F10 and other Living Room PC accessory products, to increase the product diversification. At the same time, Mele also increase market investment on the emerging e-commerce platform, the establishment of the official's flagship store in Tmall, 360buy and successfully entered the 1 The Store. And is about to form cooperation with Suning.com, Gome mall, Dangdang.com and other e-commerce platform providers. Since early 2012, Mele Digital released the country's first Living Room PC A1000, once released A1000 immediately achieved excellent market performance. One of the Living Room PC A100 has achieved monthly sales of 5,000 units in 360Buy. 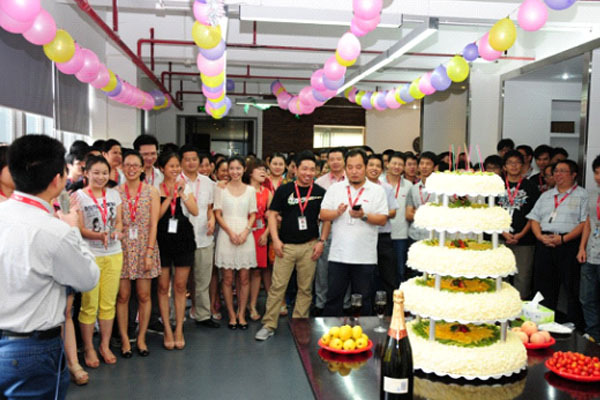 On this year August 27, at Taobao juhuasuan.com, A1000T achieved an impressive single-day sales of 796 units. Now, the Mele digital Living Room PC products has become the HD media player industry leader, product features have been imitate by several companies in the industry. Mele not only has strong overseas market share, in domestic market, Mele continues the release of new products and new user experience interface, which will bring profitable quality products to every agent cooperate with Mele. Mele overseas sales department is one of the most proud departments, every year more than 90% of the sales orders are from this department, it grantees the power of Mele rapid development! 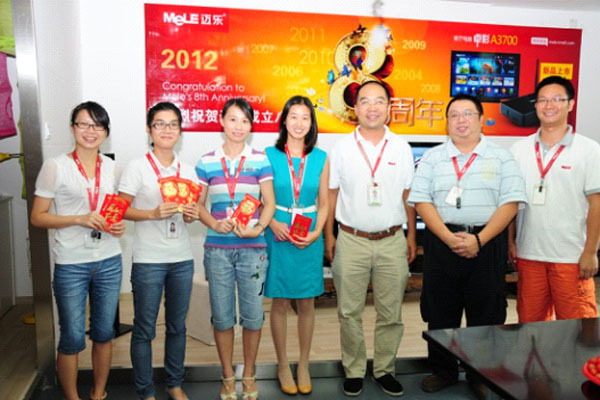 Especially when the current international environment is not ideal, Mele overseas sales colleagues continue to develop new customers, achieved good results in the sales of new products and ensure continued growth of sales performance. In the end, all staff sings Happy Birthday together and wishes Mele has a bright future!